Is your company ready for a rapidly-changing industry? The technological revolution in the automotive industry is mind-blowing: connected cars, automated supply chains and the change towards electric and hybrid vehicles are all happening at a rapid pace. In addition, the political climate is directly affecting the automotive industry: Brexit, border controls, customs and emission laws are all more or less unpredictable events that manufacturers and distributors need to react to. This all adds to uncertainty and you need to be agile enough to respond to all these changes to stay competitive. One increasingly important area to focus on is inventory management with the rapidly changing supply, demand and spare parts needed for the new types of vehicles produced. It’s therefore important to optimise inventory management by using appropriate solutions. This blog post will show you how poor stock management can be devastating for car dealers and wholesalers and how well-managed inventory is a competitive advantage. One of the main disruptions is the change in consumer behavior. For decades, car manufacturers pushed new models onto the market at a regular pace, produced them in large numbers, and the customer simply had to choose between one of these already produced models. This meant that manufacturers and wholesalers could predict the demand for spare parts pretty well and there was a decent level of certainty in the industry. Nowadays, the “pull” principle has taken over and the industry is increasingly focused on the true needs of customers. Cars are configured into details by the buyer and can, according to their ideas, be assembled and produced using available modules. This is great for the consumer but poses major challenges to many players in the industry due to the unpredictability of which components will be demanded on the automotive aftermarket. The complexity of inventory management also increases with the increasing numbers of articles, and agile production methods as well as growing e-commerce make manual processes outdated. The large Original Equipment Manufacturers (OEMs) are generally one step ahead and rely on advanced software for inventory optimisation, forecast calculation and purchasing automation. However, more and more medium-sized industry representatives have recognised the benefits of automation, especially those who can connect to the systems of their suppliers and/or customers. So how do bad stock management processes affect automotive industry wholesalers and why is it crucial that SMBs deal with this issue before it’s too late? The most obvious immediate impact is lost orders and customers. Customers demand a certain delivery time, depending on the product, and when you fail to deliver on time, a competitor is just a click away and your customer is most likely no longer your customer – and once you’ve lost a customer it’s really hard to win them back. However it’s not only your current customers that are at stake – with the rise of online evaluations and reviews, a bad reputation can spread like wildfire on the web. This is even harder to recover from and can even, in the worst case, lead to the failure of your company. On the other hand, if you keep too much stock in order to guarantee a high product availability, you are putting your business in a much weaker financial position. Not only are you tying up capital that could be invested elsewhere, but you also risk ending up with old inventory that decreases in demand as new cars enter the market. Writing off or selling at large discounts to get rid of old stock can be devastating in an uncertain market. You need margins to be able to maneuver your company right if the industry takes a sharp turn. As in so many cases, the right way is the middle way. If you can have the right articles in the right quantity at the right time you will be in a much better position to serve your customers and respond to change. It’s as easy as that! But it’s still not that easy. These inventory management challenges aren’t new, but they have become more prevalent due to growing uncertainty factors. The good news is that there are ideas, processes and tools to help you manage the challenge. First of all, you need a good process for demand forecasting. With mathematical models and algorithms, stock history can be analysed and the future requirements calculated for each individual article. Based on this, it’s also possible to identify outliers and trends and then implement a warning management or automatic inventory replenishment system. Other methods include inventory classification such as ABC or XYZ analysis. For example, a typical ABC analysis shows which customers or products are the most likely to be involved (A) and the least (C). The accuracy of these classifications can be tested with simulations of likely inventory scenarios. These are all concepts that have proven to be successful, but they must also be applicable in a manageable form since no company has the resources to use such calculations and algorithms manually every month. Nowadays, most companies have an ERP system which often also offers modules for inventory and purchasing management. Using software to manage these concepts is generally the right approach. It enables an agile organisation that allows for a middle path for optimal planning. However, due to the changing conditions of the automotive industry, it’s recommended to go deeper into the details. Many companies in other rapidly changing industries are realising their ERP add-on isn’t powerful enough, and they’re still not realising the full potential of inventory optimisation. Knowing you need to be prepared is one thing, but how do you get your warehouse into shape to outlast any upcoming twists and turns? 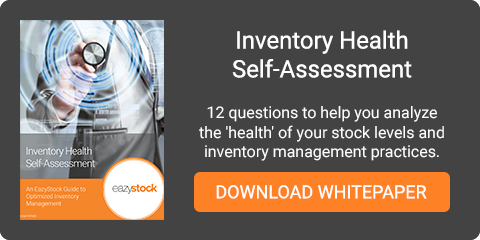 Take a quick look to see where you can strengthen your inventory with our guide; answer these 12 quick questions to analyse your warehouse and devise new strategies!